Little Nightingales Day Nursery opens in September 2010. Open daily from 9am to 6pm 51 weeks of the year. Beautiful enclosed garden with our own vegetable patch so children can learn and watch how there food grows. We have a play area inside and plenty to do outside, Arts and Crafts and story corners. We make learning fun at Little Nightingales. Until September we will be open for Summer camps. Based In Nueva Andalucia on Calle Lisboa, situated near El Picadero restaurant. 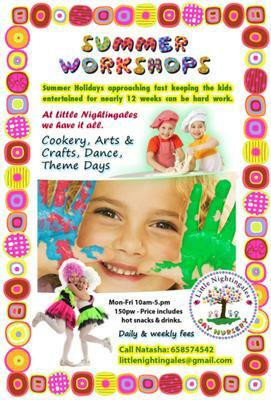 Birthday parties at Little Nightingales is the best place to hold them, they take care of everything plus the mess. My 5 year old girl is at this summer camp she is having the most amazing time, Face painting, arts, paddling pool, the owner even bought the children two little Turtles to watch and help look after, and even after a week full of children the owner didnt mind baby sitting at an additional cost of course but making my summer a really good one.